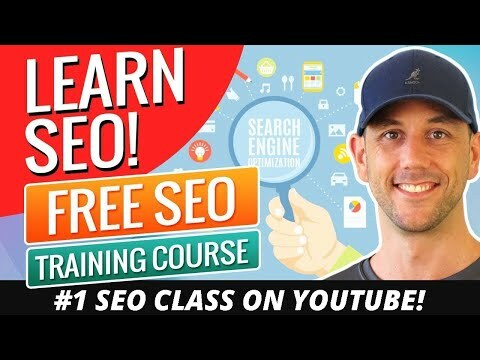 Learn SEO with this free SEO training course recorded live! Avoid wasting money on an overpriced SEO course and study this free search engine optimization class, today! This is going to be a beginner to intermediate SEO training to help make sure you are implementing the SEO best practices in your content marketing campaigns. The above video shows my favorite keyword research tool I use every day… But it is a paid tool, so there is a monthly fee, which won’t work for everyone. Either way, you need to get proficient at keyword research and you need to learn a kw research tool in order to properly execute SEO campaigns. This will get you caught up on the basics and I will cover some of these same SEO lessons, but in a different manner that will focus on ‘how’ to do what I explain in that above SEO video. This class is going to show you the tried and true SEO methods I’ve used to generate tens of millions of visits to my websites. I don't understand how you monetise this. Another incredible video. Very inspiring to keep going and be consistent. Great information Thank you! This is awesome!!! You rock!! Super valuable info!! Miles, great training. Do you know if using the video blog post feature in Thrive Themes (pressive theme) would affect the <H1> tags? I use the video post because it looks great but I don't l know if it negatively impacting my SEO. The video is automatically placed in the heading. Can you advise? I love you Miles Beckler. I think you're the bomb. Have you ever thought about throwing that board away and do it on a computer and give your viewer an awesome experience because, your content is amazing!! Let me ask you just add a new year in front of a video to gain more views do you even do any changes in ur videos for current year? Hey Miles, thanks for this. I already subscribed and just wondering if would there be instances that you could be giving away certificates. Like making this training as formal with certificate? Thanks. I have watched mutiple very long videos about this pillar page concept. You have explained it the most clear in the least amount of time! What is unclear that I am trying to figure out for certain is as follows. Step one: Make a "pillar page" for me that is a free commercial roof inspection In that Pillar post (which is a WEB PAGE not on my main website menu just in the background correct? ), I go on to mention in the pillar page what to look for in an asphalt shingle roof (link to sub topic, which is a BLOG POST OR ANOTHER WEBPAGE??!) and then briefly tile roof with (link to subtopic, again webpage or blog post?!). MY QUESTION that I need to know for certain to get started is, are the subtopics webpages or blog post? I know they have to link. Second phase of the question: Lets say I figure out if the sub topics need to be webpages (not included in the main menu) or blog post, either way linking to the pillar page and pillar page to them. Now I have all that set up. Now I go to hoot suite to post the links to my sub topic blogs to all the social media outlets. These post are exerts of my subtopic heading in the title, with a link to that sub topic on my facebook for example. Again same question, am I linking back to a sub topic blog post and in that a link back to the pillar page??? Do I just post on social media the pillar topic like I would post the sub topics on social media? If the subtopics are also webpages and not blog posts, I still link the webpage to the main pillar webpage but then what do I do? Make a short blog post linking to the sub topic webpage which then intern links to the pillar webpage? Then take that blog post and post that title link to facebook/ twitter ect. Trying to drive traffic from FB>blog post>subtopic>pillar topic? I may be over thinking it but its a lot of work (do it right the first time kind of thing) I am just confused on the technical route we are trying to drive traffic. from social post to webpage or blog post and are we suppose to link both pillar topic and sub topic on our social media outlets? If I want to rank for commercial roof repairs plano tx. I would create that as the pillar title with links to many sub topics related to commercial roofing in Plano tx. I also want to rank for commercial roof repairs arlington Tx. Do I create a similar (not exact wording copy) pillar topic with similar sub topics just for Arlington? If you could please help me answer these 3 questions I would greatly appreciate the help. I am trying to avoid running circles in the drive way. Most of my competition is doing the old seo content so I am more confused than ever. Miles you are beyond AMAZING…! GOOD GOD THANK YOU! WE ARE BLESSED! All information provided by you on SEO is Basic level or mastery level ? Does anyone know which blogs him and his wife own outside of his own website? Miles, thanks a ton for teaching the world such awesome info. Regarding the content, what do say about curating content? In other words using someone else’s article, extract it on my site , quoting a link to their site and adding my own comments in the article? How does Google view such curated articles ? on youtube you are no.1 when searched for keyword "keyword research"
You spoke about merging your old articles, do you still keep the old articles and redirect it to the bigger one or delete the old articles? 1. Adding the video to uTUBE and not making it available to the general public but hiding it only for users that access the video through your blog site? 2. Making is widely available to anyone that searches utube? Does one approach help generate more traffic? I subscribe you immediately because you are giving very important content free. Very Nice… Does it matter what word press theme, you use? Do you have a link to themes? and Hosting? from blue host. good sruff thats ! Wow, I cant get thru more than 25 minutes. This is all over and BORING. Hi, I need your advice or tips very badly. I'm a beginner and just started learning digital marketing tactics. I found you and so I'm planning to build a website to implement whatever I'm learning here and get good results so that I can show this as my experience while attending a digital marketing job interview. Is a single blog post enough for that, or should I write frequently for practising SEO(Ranking, link building, other on-page and off-page methods, and to get a hands-on experience on many tools) and all ?? I want to do full time blogging too, much much later…not sooner, so I will gradually use the same site for professional blogging. So to get started, Is a single blog post, which is fresh and inspiring, enough for implementing them? If not, I have to be more serious in content writing too.